HTML has evolved a lot over the years. It is the most commonly used markup language but it is important for it to stay relevant with the present day demands. There were many updates to HTML in the past. HTML 5 is its most recent update. 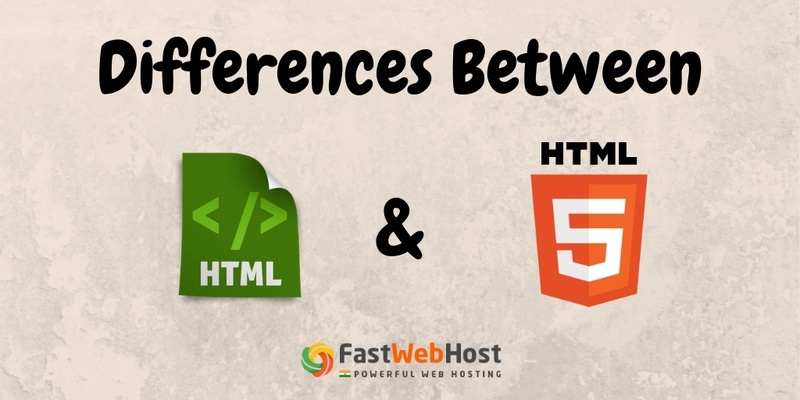 In this article we will highlight the difference between HTML and HTML 5, the most recent and advanced version of HTML. HTML has a widespread usage in many web pages and applications . It was first introduced on internet by Tim Berners-Lee in late 1991. HTML1.0 : It is the most basic version of HTML it was introduced with very limited features. In other words there is not much you could do to your web page with this version. HTML2.0 : This version of HTML has served its purpose quite well but after that the designers demanded more control over their web pages and more ways enhance the look of their website. Which HTML 2.0 failed to do. HTML3.0 : It has often referred to documents having tags specific to browser rather than documents that cling to HTML 3.0 draft. Above all, HTML 3.0 being so big also led to its expiration. HTML4.0 : Another version of HTML but even this had its limitations. Browsers like Netscape have not done great in implementing many features of HTML 4.0. Web Pages that included HTML 4.0 specific tags would look good in explorer but were a disaster in Netscape. XHTML : It doesn't have many new tags that comes with it, i was introduced to cope up with new browser technologies. It is not an extensible language and cannot be parsed into many browsers. HTML5 is the fifth and the current prime version of HTML standard, and comprehends XHTML. It was first released for public facing on 22nd Jan 2008. HTML5 is intended to enhance the language to support latest multimedia and other new features, to keep the language easily readable for humans as well as computers, web browsers etc. It includes detailed processing models to uplift inter operable implementations, it extends and enhances markup available for documents. <audio> & <video> tags are new features of HTML5 but are not supported in HTML. We can draw many shapes like circle, square, triangle in HTML5 but not in HTML. HTML5 is more mobile friendly compared to previous HTML versions . HTML supports vector graphics only with the help of flash, VML etc but in HTML5 we can use virtual vector graphics without them. These attributes are absent in HTML but their presence in HTML 5 makes it very easy for web developers. HTML doesn't support drag and drop effect whereas HTML 5 does. Despised elements like big, center, frame, noframe, frameset, tt, strike, basefont, aaplet, isindex, dir, font etc are withdrawn. Geo Location of a user can be tracked with the help of JS Geolocation API in HTML5 but it is next to impossible in HTML. HTML5 presents mathematical notations better than previous versions using MathML. HTML5 allows better input attributes and form controls like time, date, URL, search, email, number, range etc but these are absent in HTML. Persistent error handling saves a lot of time and money in HTML 5 However HTML doesn't have error handling feature. Using <canvas> element user can draw graphics making usage of Adobe Flash old hat. FastWebHost India supports all versions of HTML in their web hosting services. Any technology is always subjected to change and development, so is HTML. There is no doubt that HTML5 is a much better version of HTML compared to its forerunners. But HTML5 is yet to unwind all its benefits. It is proving to be very successful with every passing year. It is expected to be adopted more in the years to come. However to provide a better web browsing experience to the users developers have to embrace more advanced technology of HTML5 to meet the present day demands of the industry and to vanquish challenges like web application compatibility and mobile technology .